Wyatt Bensken BS Public Health ’16 and Public Health Scholar attended the meeting of the National Prevention Council at the Department of the Interior. Through his internship in the Office of Public Health of the National Park Service, Wyatt worked on a project analyzing the smoking and tobacco policies of the 59 national parks. This information was presented to the National Prevention Council as the National Parks were being used as a model for health. 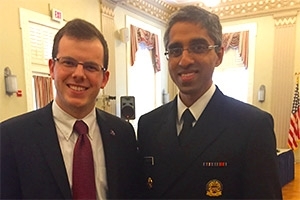 After the meeting, Wyatt met with Surgeon General Dr. Vivek Murthy about Public Health and what it means to be a student of Public Health at AU. In addition to the presentation to the National Prevention Council and the Surgeon General, the information was passed to decision-makers to inform them on the current status of smoking in national parks, and to make recommendations for updating policies to reflect public health priorities.